In an attempt at a fresh start, Oumae Kumiko enters a new high school intending to make new friends, join a new club, and take a new approach. 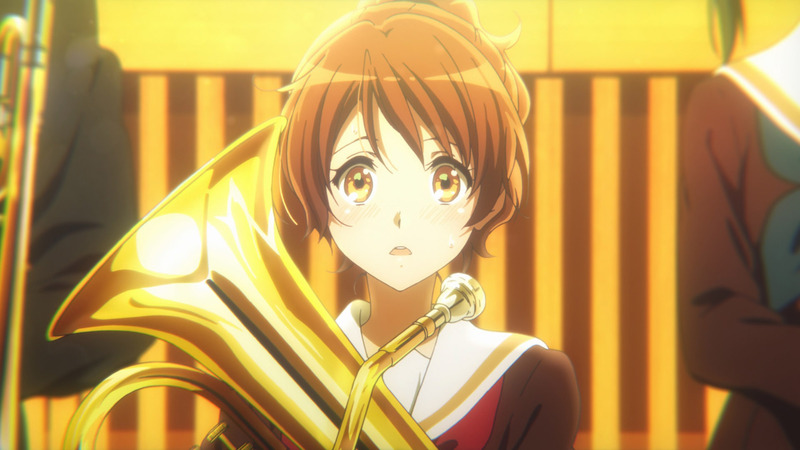 Despite her best efforts, she is pulled to an all too familiar situation – playing the euphonium for the school’s “terrible” wind ensemble. With a new advisor and a lofty goal, the group holds the potential for improvement, but not without a struggle. Based on that synopsis alone, Hibike! Euphonium (Sound! 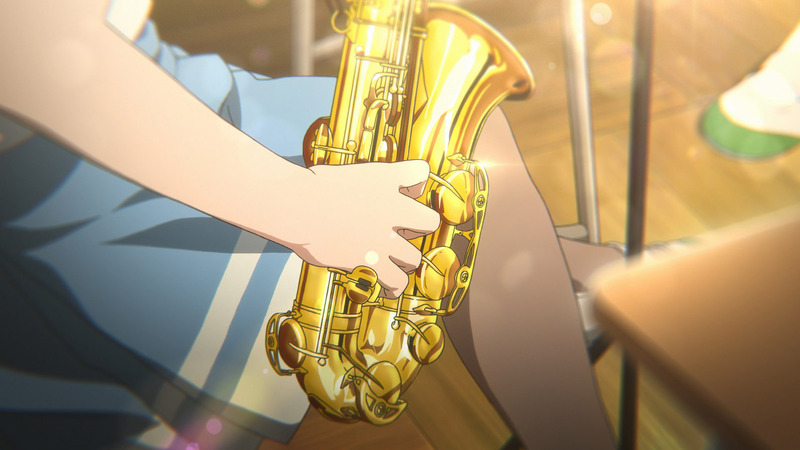 Euphonium) is a fairly standard story, offering the type of situation that many people can encounter in everyday high schools, not to mention works of fiction. What sets this apart is the execution. The characters, music, and visuals all lift the story above its common setting, allowing it to provide the best potential result. One of the greatest strengths of the story is how it goes back and forth tonally, with serious and humorous moments transitioning naturally. While not the type of story to be overwhelmed by oppressive drama, everything feels very well-paced, with each situation playing out as necessary and without overstaying its welcome. Another asset is the portrayal of the band’s efforts. As the story progresses, one of the clearest differences over time is the band’s sound. Within the wind ensemble are students of varying proficiencies – whereas Asuka, Reina, and several others are clearly experienced and skilled, Hazuki and many other freshmen are entirely new to performing music. Gaps in skill across the board complicate intentions for a unified sound, leading to a disjointed and dissonant product. Due to a lack of both experience and disciplined practice, the group starts out in an awful state, loosely held together by the faintest string. Once their new advisor, Taki-sensei, becomes involved, and the group begins its push for the national competition, the change in their overall sound becomes evident. Instead of selfishly lazing about, they put energy towards succeeding with their goals. As a result of practice in their sections and as a full ensemble, they are in-time, on-pitch, and dynamically matched – not particularly amazing, but at least capable of playing by-the-book. Going back to listen to their original performances also highlights one of the greatest advantages of the series’ music – an actual audible improvement over time. Besides the band’s efforts, the show also gives plenty of attention to individual characters. 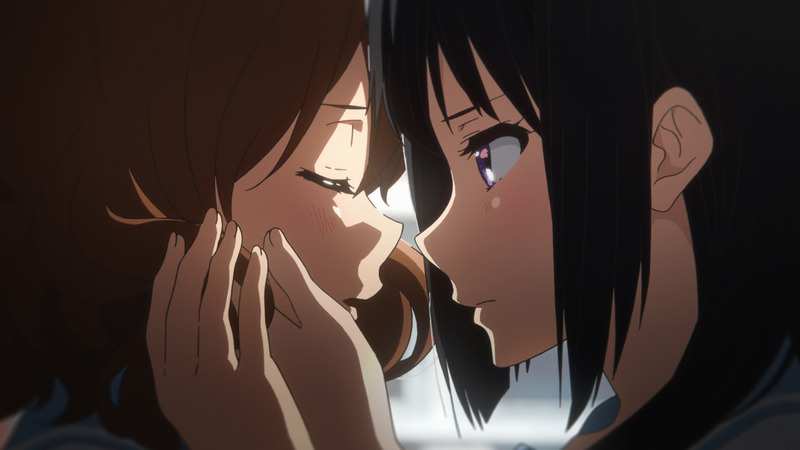 Most important in the grand scheme of things are Kumiko and Reina, whose relationship is not only one of the best elements of the show, but also adds an interesting dynamic to the main story. While initially hindered by an awkward relationship originating in their middle school days, certain events cause them to grow closer. Their newfound connection takes root within the main story, allowing them to encourage each other in endeavors towards becoming “special,” and eventually change how some things play out. While each of them can certainly carry attention solo, they better bolster the series as a pair. Besides these two, many other characters contribute to the main story, not just for the sake of advancing the plot, but to take part in realistic character interactions. 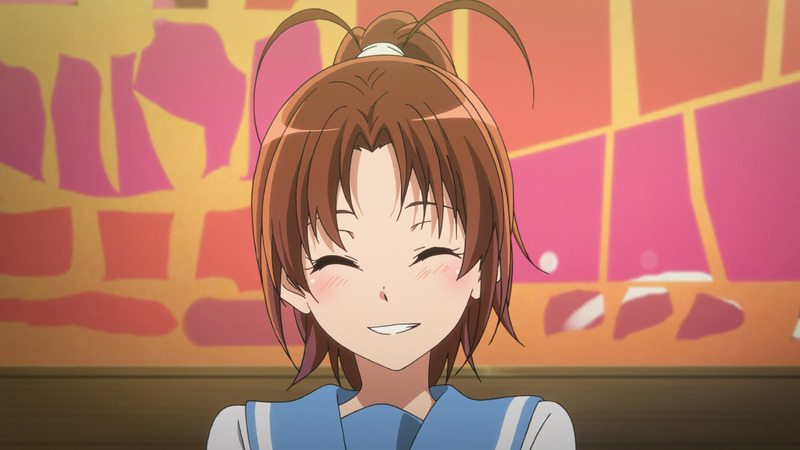 Characters such as Asuka function as both a role model and an impossible ideal, showing what devotion to the music can lead to while avoiding personal drama. Others such as Natsuki reflect the band’s general progression – initially apathetic, but becoming serious in aiming for the best possible results. The cast strengthens everything about the series, allowing the story to cap out its potential with few hindrances, while also allowing individual characters to flourish within the greater picture. As a series about a wind ensemble, music plays an important role throughout. Besides a stark before and after contrast once the band has properly practiced and prepared, another audible comparison plays a key role towards the end of the series. At one point, auditions are held to narrow down the number of performers for an upcoming competition, with special attention given to a particular solo. While the two competing performers play the piece perfectly note-for-note, the discrepancy comes down to differences in tone and dynamics. Whereas both players could carry the part effectively, one manages to offer something more. Fortunately, the difference is made quite clear to viewers, as simply listening to both performances clearly demonstrates why one would be considered superior. Having the music so clearly enunciated takes this from being just a show about music, to a show that uses its concept for the best possible outcome. While the band’s music is rightfully given plenty of attention, the show’s background music is also excellent. Most of these songs contribute peaceful harmonies that carry a wealth of vibrance, while others push dramatic situations with an ounce of additional potency. Stylistically, it’s all quite different from the band’s performances, but this difference manages to complement the band performances – whereas the soundtrack is relatively simple, the ensemble has more complex pieces that allow each instrument room in the mix, optimizing the overall tone and bringing attention to all the parts building up the full sound. The backing music allows the focus to remain on the characters when appropriate, but falls to the sideline once practice and performance take the stage. The voice-acting is another highlight of the show. None of the characters’ voices stand out negatively, although many shine for excellent performances, especially Kumiko and Asuka. Whether conversing, narrating, or simply thinking out loud, Kumiko’s voice always matches the situation perfectly, naturally meshing and commonly offering a pleasant bit of extra oomph. Asuka is a bit different. She shines in moments of playful exaggeration, sounding a bit embellished, but appropriately so. If this style didn’t match her personality, it would come across as a bit awkward, but it all lines up without issue, and she takes the spotlight in plenty of scenes as a result. Although the visuals don’t connect to the main story in a similar manner to the music, they stand out spectacularly on their own. Besides good use of color and lighting, excellent animation, and healthy doses of visual humor, one of the most prominent effects is depth of field alterations. This is often used to concentrate on one specific thing in a scene, leaving everything in the foreground or background out of focus and blurred. Instead of coming across as just an optical trick for the sake of making everything look pretty – which it certainly accomplishes – it is more often used from a directorial perspective, putting the attention on something deemed most important for the shot. Combined with the overall lighting, particularly for evening scenes, this provides some beautiful visuals. The character design is also very nice. 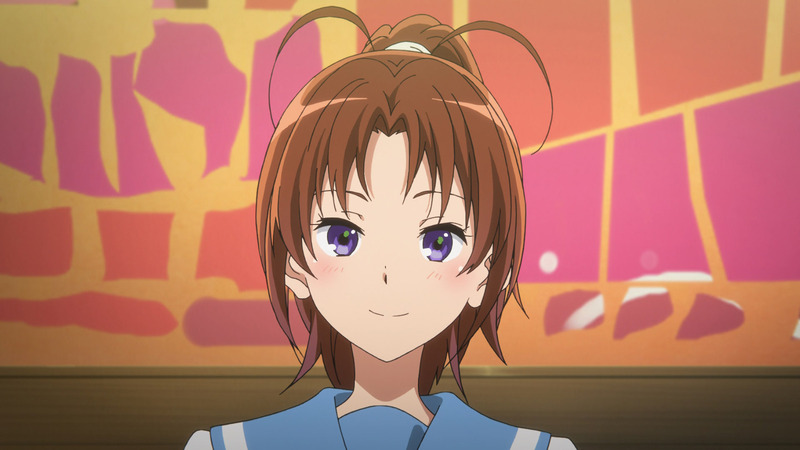 While the show is chock full of Kyoto Animation’s trademark pretty young anime girls, the variety in characters’ appearances – especially when taking into account that the band has over 60 members with the same uniforms – keeps any overlap from causing confusion from one character to the next. Every character has a good degree of separation without relying on lazily thrown together side characters that seem bland compared to main characters. Taking all of this into account, this is one of the best-looking shows that I have ever seen. In fact, let’s take that a step further – this is one of the best shows I’ve ever seen. The base story isn’t particularly original, but each of the characters come together to not only make the end product worthwhile, but memorable. The interpersonal relationships allow each of them to shine in different settings, with the bond between Kumiko and Reina naturally developing into one of the most enjoyable elements. Aesthetically, the series offers some of the best, with music that effectively connects to the story, and visuals better than you see in most movies. Joining the group on their trip to the national competition allows the viewer to witness their moments of success and failure, fully immersed in their endeavor. In an ensemble, success depends on the collective efforts of each member. One person playing off the beat; one person hitting wrong notes; one person putting forth the bare minimum: this is all it takes to throw off the entire sound. But when each member capitalizes on their potential, the entire ensemble is stronger for it. That’s when you can create something special. And nothing demonstrates that quite like Hibike! 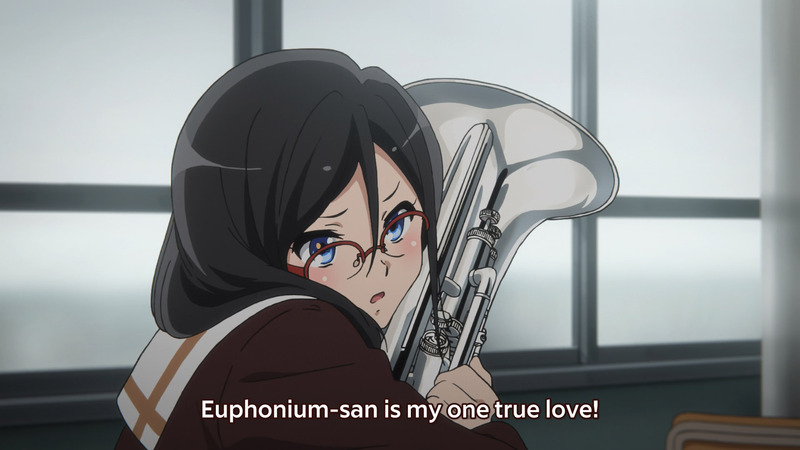 Euphonium. Recommendation – Watch it. It will likely appeal more to people interested in music (wind ensemble or otherwise), but it’s excellent, so it is absolutely worth watching regardless.